I am somewhat torn on this portable washer. As with most items, there are both good things and bad things about this product. The washer only has a load capacity of 9.2 pounds and can only do one blanket at a time. While this may seem like a drawback, I was really very impressed that it was able to do blankets at all with its small load capacity. 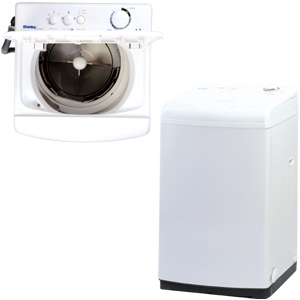 Because of this capacity, you will only need about an ounce of detergent per load. Also, since this washer is portable, it obviously will not switch from hot and cold water on its own. I did not think this portable washer was very heavy; in fact, I was able to move it around myself. This washer is very sturdy for its size (although the controls seem to be a little fragile), cleans incredibly well, is very quiet and, even for me, the instructions were a breeze! Obviously, because of its size, the cycles are shorter than a regular washer and it will take you a while to get through a lot of laundry. One problem I have noticed is that the drain hose does leak sometimes and there have been a few times that we have had a small pond in our kitchen. Also, I really liked the fact that we were able to hook this washer up to our kitchen faucet since we don’t have washer hook ups in our apartment. Oh, one other thing I was not so fond of was that the drain hose needs to be raised up at least 26 inches for it to work right. Overall, I think this was a good purchase. It has made our lives easier overall and that was really what we were looking for. If we had the room, I would definitely opt for a permanent washer, but this works great with out situation. Highly recommended! Join in and write your own page! It's easy to do. How? Simply click here to return to Portable Washing Machine Consumer Reports.